A simple blood test could improve treatment for 1 in 6 stage 2 colon cancer patients, new Mayo Clinic research finds. Colorectal cancer is the fourth most common cancer in the U.S. and the second deadliest. With colon cancer, some earlier stage patients fare worse than some later stage patients, who usually benefit most from chemotherapy. 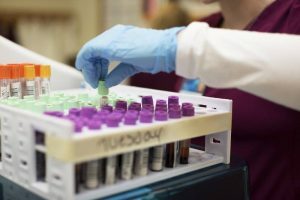 But a research team at Mayo Clinic has discovered that a simple blood test could help determine which patients are at a higher risk and therefore could benefit from therapy. The researchers also found many patients who could benefit from the test likely aren’t receiving it. The team of physicians and scientists, using data from the National Cancer Database for 40,844 patients, looked at a blood test that measures the protein called carcinoembryonic antigen, or CEA. Carcinoembryonic antigen can be found in higher levels in people with certain cancers, especially colon cancer. The findings, published in the Journal of Gastrointestinal Surgery, showed that knowing these blood test results prior to treatment could have changed the classification from average to high risk for more than 1 in 6 stage 2 colon cancer patients. That change could have altered treatment options, including whether to use chemotherapy. There are four primary stages of colon cancer. Generally, with stage 2, the cancer hasn’t spread to nearby lymph nodes or distant organs but has grown into or through the wall of the colon.